Get your chocolate fix for breakfast with these deliciously creamy (and healthy!) 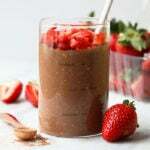 Chocolate Overnight Oats. 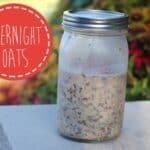 This overnight oat recipe is made with rolled oats, chia seeds, maple syrup, almond milk, and a little Greek yogurt! You know what makes Monday’s worth getting up for? 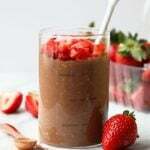 These Chocolate Chia Overnight Oats. Are they good for you, you ask? You bet your bippy they are. They are packed with fiber, protein and a bowl of these overnight oats will keep you going all day long. Which reminds me, I have been hungrier than a hungry hungry hippo in the past three weeks than ever before. Has that ever happened to you? I have been traveling quite a bit over the last month and I feel like that has attributed to my hunger. Hear me out. I went to a bachelorette party in Washington. It wasn’t your normal bachelorette party. I went alpine hiking with 12 amazingly strong women and it was the single most physically challenging thing I’ve ever done. We hiked 6,000ft in a day and I slid down a mountain and had to save myself with an ice ax. It’s like my metabolism boosted itself into a frenzy. After Washington, Team Fit Foodie hung out in the Boundary Waters. It was an amazing trip where you have to rely on your physical body to survive. Needless to say, I haven’t been able to satisfy my hunger since those two trips. I’ve been intentionally eating larger breakfasts and trying to keep sustenance in my bag at all times. These Chocolate Chia Overnight Oats are just the breakfast I need to feel satisfied all day long. 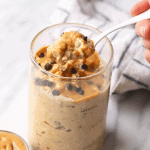 These easy overnight oats taste like chocolate ice cream. No joke! I could eat it all day, every day. They are creamy, easy to make, and perfect for meal prep breakfast. We can attribute the creaminess of these oats to the Greek yogurt! If you are vegan, leave out the greek and add more almond milk. If you are all about the dairy, overnight oats with yogurt are a dream come true. Now, Let’s look at the ingredient line-up. First, mix dry ingredients in a bowl. Then add wet ingredients and mix again. Top with greek yogurt and fresh strawberries. 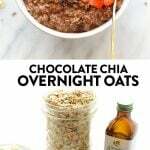 Are you interested in more Overnight Oat Recipes? 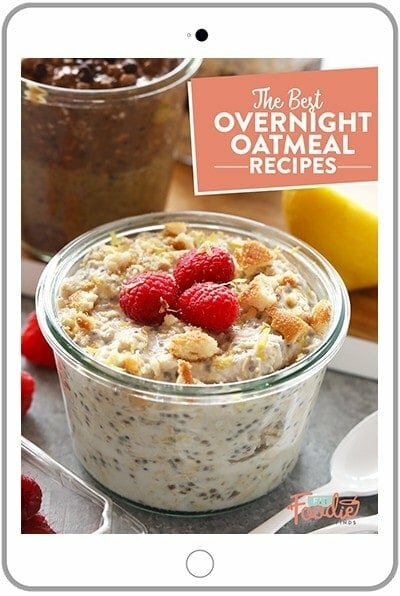 Subscribe to The Fit Foodie Finds email list and you will receive a FREE Overnight Oat Ebook with all of 15 of our favorite overnight oatmeal recipes, plus 5 NEW recipes that you can only get if you subscribe and receive the ebook. Do it now! CLICK HERE TO SUBSCRIBE TO FIT FOODIE FINDS. If you already subscribe to Fit Foodie Finds, then you can still click HERE to re-subscribe for the free download!